Head to the border for a Brownsville history lesson and wildlife watching. A recent visit to this border city, which I sometimes bypass for a certain nearby island (hint: South Padre), reminded me of Brownsville’s variety of outdoor activities, unique museums and little-known history. That history goes way back, but I start with May 1846, when a two-year conflict was spurred by disagreement over whether the Rio Grande or Nueces River should serve as the boundary between Mexico and the newest U.S. state, Texas. 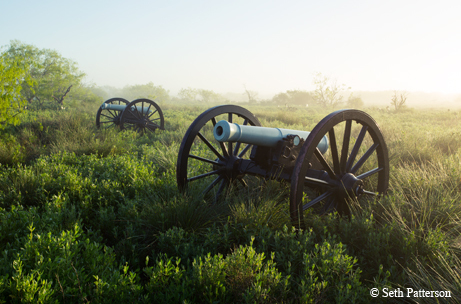 The first battle took place at what is now Palo Alto Battlefield National Historical Park on the north side of Brownsville. The conflict ended with U.S. forces occupying Mexico City and doubled the size of the U.S. with the addition of parts of Texas, Colorado, Utah and Wyoming, and lands that are now New Mexico, Arizona, California and Nevada. I walk a half-mile from the visitor center to where opposing forces in this mostly unknown yet significant battle faced each other, a windswept coastal plain with a few small trees, yucca and prickly pear cactus. Guided ranger walks cover the causes of the war, why battles occurred where they did and how the clashes developed. For those who want to see and hear what it felt like, living history programs staged one Saturday each month demonstrate soldier life and muskets and artillery from the period. In addition to history buffs, the battlefield also attracts birders looking for Harris’ hawks and aplomado falcons. Palo Alto Battlefield National Historical Park protects the site of the first battle of the Mexican-American War, a conflict that changed the map of North America. A nine-mile hike and bike trail connects the historical park with the Mitte Cultural District, a walkable wedge of Brownsville containing a wealth of museums and the Gladys Porter Zoo. Porter, the daughter of Earl Sams, chief executive of the J.C. Penney Company for 30 years, championed construction of the zoo. Today, its 30 acres house more than 1,500 animals from Africa, Asia, tropical America and Indo-Australia amid lush tropical landscaping. My favorites include three generations of a western lowland gorilla family, a free-flight aviary (birds are a big thing in these parts), and a new aquatic exhibit of sharks, jellies and stingrays. Across the street in Dean Porter Park, I take in a crash course in area history from pre-1700s up to 2000 by perusing the Ringgold Civic Pavilion’s Pictorial History, a reproduction of an original 14-by-40-foot mural in watercolor on ceramic tile. A short walk from there along the resaca — one of the pools created by the ever-shifting course of the Rio Grande that dot the city — the Children’s Museum of Brownsville aims at tykes up to age 8 with architecture and exhibits true to the regional culture. Hands-on activity areas include a doctor’s office, café, grocery store, weather station, South Texas farm, lighthouse and shrimp boat/dock. Outdoor interactive water exhibits and activities were created in partnership with the Cornell University bird center. Next door at the Costumes of the Americas Museum, I gawk at dozens of elaborate costumes representing almost every country in the Western Hemisphere. In 1916, founder Bessie Kirkland Johnson belonged to the San Antonio Pan American Round Table, a women-run organization designed to foster understanding and friendships across the Americas. After moving to Brownsville in the 1930s with her collection of Mexican clothing, Johnson challenged Round Table members there to each acquire a costume from assigned countries. The women assembled one of the largest collections in the Western Hemisphere, colorful creations complete with jewelry and artifacts such as drums, baskets and pots. Across the park and a few blocks down, the Brownsville Museum of Fine Art holds more than 350 paintings, prints, drawings, sculptures and photographs, including works by Marc Chagall, N.C. Wyeth and Alexander Calder, as well as 100-plus historic pieces created by the museum’s eight founders and their contemporaries from the 1940s. Its elegant building anchors one end of Linear Park, formerly the Southern Pacific switching yard; at the other end, the Historic Brownsville Museum occupies the old Southern Pacific Railroad Depot. It has displays on the Mexican–American War and the Civil War and its last battle, which occurred at Palmito Ranch, just up the road, on May 13, 1865. The month of May has often been busy around these parts, apparently. Down the street and behind the zoo, historical markers along the main path through the Old City Cemetery make it visitor-friendly, and diverse monuments and headstones tell many stories. Established in 1853, the cemetery boasts occupants who were veterans of every U.S. war (except the American Revolutionary War), steamboat captains, mayors, judges, merchants, ranchers, Spanish land grant holders, victims of yellow fever epidemics and probably a few miscreants. There are sections designated for the Society of Benito Juarez, Masons, Catholics and Independent Order of Odd Fellows, as well as a Hebrew cemetery and a potter’s field. The Brownsville Historical Association has computerized records to help locate specific plots. My final museum stop requires a drive to the airport, where the Rio Grande Valley Wing of the Commemorative Air Force museum’s hangar houses more than a dozen restored aircraft — along with military vehicles and hundreds of artifacts including uniforms, photographs and weaponry — and offers guided tours. The CAF also operates fully functional World War II aircraft that fly at air shows and other events. In the adjacent Barnstormers Lounge, dozens of model planes hang from the ceiling while aviation enthusiasts sip a cold one and watch planes take off and land on the runway outside. Some are more than willing to share a tale or two. Ready to spend some time outdoors, I cross town to Resaca de la Palma State Park, part of the World Birding Center. Here, diligent birders seek out nearly 300 species, including rare migrants and special locals such as the olive sparrow, long-billed thrasher and white-eyed vireo. I take a casual approach to birding, strolling some of the eight miles of trails, spotting green jays and a hawk and, from a deck over the water, several snow-white herons. The park holds nature hikes, bird/butterfly walks and night walks, and rents binoculars and bicycles for enjoying the trails and a paved three-mile loop. 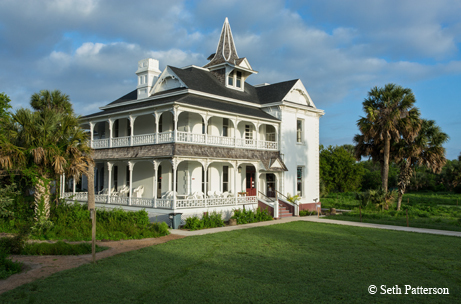 Sabal Palm Sanctuary is home to the Rabb Plantation House and harbors one of the most diverse ecosystems in the nation. Sabal Palm Sanctuary protects one of the last remaining stands of this native palm that once covered more than 60,000 acres along the Rio Grande. One of the most diverse ecosystems in the country, it contains 300 kinds of plants, 300-plus bird species — including the Rio Grande Valley’s iconic green jays and chachalacas — and thousands of insects, along with mammals, reptiles and amphibians. Previously a plantation, the property became a National Audubon Society sanctuary in the 1970s, then closed in 2008 in anticipation of a section of border wall cutting across the property. In 2010, the Gorgas Science Foundation took over management, offering guided bird and history walks every Saturday plus more than four miles of nature trails and an observation deck over the Rio Grande. Twenty miles east of town, the road ends at Boca Chica Beach. This is Texas beach the way I remember it from childhood, just sand and water and the sound of surf, wind and birds. 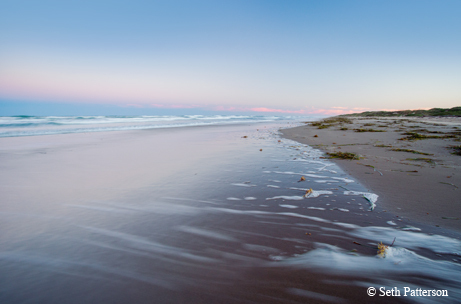 Boca Chica is a stop on an eponymous loop of the Great Texas Coastal Birding Trail. Common sights include ospreys; aplomado, merlin and peregrine falcons; Harris’ hawks; Chihuahuan ravens; horned larks; piping and Wilson’s plovers; and red knots. I’m happy just to walk the waterline and let the sound and solitude wash over me, but those who want more action can bring binoculars or a fishing pole. Downtown Brownsville skirts our riverine border with Mexico, where I encounter another piece of history — the start of the Chisholm Trail. Spanish cattle, ancestors of our Texas longhorn, were ferried across the Rio Grande to gather for drives northward to Kansas and Missouri. City founder Charles Stillman bought land for the town of Brownsville using a fortune earned as a steamboat captain on the Rio Grande; he later sold ranch land north of town to steamboat-captain-turned-cattle-baron Mifflin Kenedy. The Brownsville dining scene has much for those who like Tex-Mex and seafood. The expansive deck at Cobbleheads Bar and Grill overlooks a large resaca that hosts kayak races in February. It features live music Thursday through Sunday and an astonishingly varied menu. I recommend the Padre Island Dip and shrimp tacos. Vermillion Restaurant serves Mexican food, seafood, sandwiches and burgers in a bar atmosphere with comfy booths. The dining room is small at the family-run Elva’s Café on West Elizabeth Street, but the food is fresh and portions generous. Brownsville’s slower pace and older feel contrast with its more energetic, high-rise neighbor on the beach. I certainly plan to continue visiting the latter, but will make a point of saving time for the former as well. The road ends at Boca Chica Beach, Texas' southern-most beach, where surf and sand mix with solitude.